History is boring most of the times. It can however be made interesting. This is possible only when it is conveyed in the form of a story. Of course, there are few exceptions to this which includes our two major epics - Ramayana and Mahabharata. We would have seen it in the form of tele-serial or movie for n number of times. 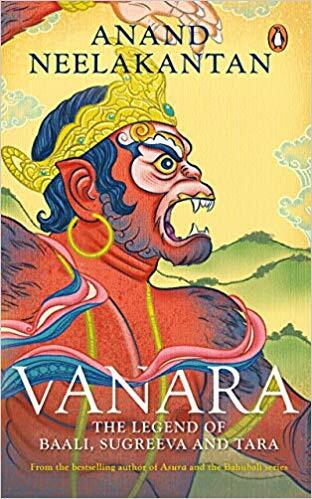 I had the opportunity to read Anand Neelakantan's "VANARA". Author needs no introduction since he is known for his famed "Baahubali" story. He is certainly a Master Storyteller and the book made me realize it through each and every page. We have seen history glorifying the winners or those who emerged triumphant and has mostly portrayed the losers in a negative way. This book is one of the exceptions where the author has glorified the legendary character "Baali". We must have read or known about the character of the protagonist and also his brother, Sugreeva. The way, the characters were used in this novel, made me realize that, not all who gets projected as good, weren't good and not all the bad, are actually bad. What did I like the most from this novel? Though this is a story which most of us know, the way the story has been retold makes it an interesting read. This book made me refresh my memories which includes the curse of Ahalya, pathini of Sage Gautama who said that Sugreeva would be the cause of death of Baali. The book isn't an exaggerated version but a realistic one which makes you keep hoked to it from the beginning till the end. I also had few learning points from this book. 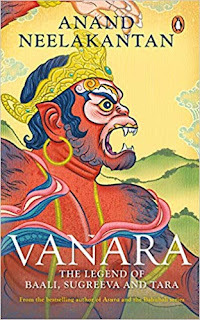 The term "Vanara" is actually the combination of Vana and Nara . Indira is not the name of the person but the Title and many have adorned it. I liked the way, author has described each and every thing in minute detail. I would like to quote couple of lines which caught my attention among many.
" An ant came to enquire and sniffed the lone rice grain that had fallen on the sand"
"Suddenly the cow pen felt empty. The lone cow in it continued to chew cud. Flies buzzed around"
The book revolves around the three major characters and how Sugreeva who loved Tara even before his brother could get married to her tried stalking her at each and every instance. The narration of the events would leave you in awe, for sure. 5. Capture of Sugreeva and Ravana by Karthya Veerarjuna and how Parasuram slains him. 7. How Baali gets trapped while he went chasing Mayavi and the sequences thereafter. This book is not speaking about anything which is not known to us but the way it speaks/portrays would make you to read, over and over again as it is unique and has been written in a natural/realistic way. Grab your copy today. This book is available on Amazon,Flipkart and in all leading book stores, Online & Offline.